Posh chairman Darragh MacAnthony and manager Grant McCann (right). 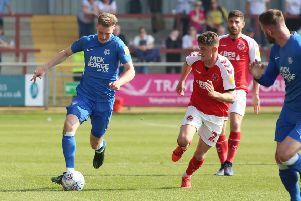 The best seat in Peterborough United’s house and a day at the training ground with the first-team squad are among the rewards on offer in the club’s Charity Day special with the Free Kicks Foundation. The home League One game with Doncaster Rovers on January 1 has been designated ‘Free Kicks Foundation Charity Day’ and club and charity have combined to make some terrific offers for Posh fans. An E-Bay auction has already started with the highest bidder winning two tickets to the Posh Directors’ Box for the match on new years day. Free Kicks and the club are also running a raffle which includes a ‘money can’t buy’ top prize of a day at the Mick George Training ground watching the players train before taking lunch with them in the club canteen. Second prize is a signed framed shirt and third prize is a family ticket for a home League One match. Tickets are now available in books of five costing £1 each. They will be available for purchase at Fleetwood tomorrow (December 17), If you would like to take some books to sell at your workplace, local pub or among your family get in touch by e-mail to enquiries@freekicksfoundation.org or via twitter @FreeKicks. Tickets will also be available to buy from the club shop at The ABAX stadium. Volunteers to take part in a bucket collection ahead of the Doncaster game are also sought. A ticket for the match and a hot drink will be provided for volunteers. Contact should be made to enquiries@freekicksfoundation.org or via twitter @FreeKicks.